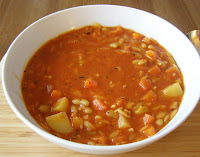 First, my apologies posting a soup recipe for those of you melting in the summer heat but I live in Ireland. 'Nuff said. ;-) Ah well, you can bookmark this and make it on a cooler autumnal evening and you should as it's really, really good. I got the recipe from one of my BBC Good Food Vegetarian Christmas magazines that I always would buy back in London. Melt the margarine in a large saucepan and add the onions and sugar. Stir well cover and gently cook for between 20 - 25 minutes or until very soft and deeply golden in colour. Stir in the sherry and mustard and simmer for 3 minutes to reduce the sherry. Add the stock, bring to a boil, reduce heat, cover and simmer for 15 minutes. While it's simmering, preheat the oven to 220C or fan 210C and line a baking sheet with baking paper or foil. Unroll the puff pastry, cut into a strip and then into squares, or whatever shape you like! 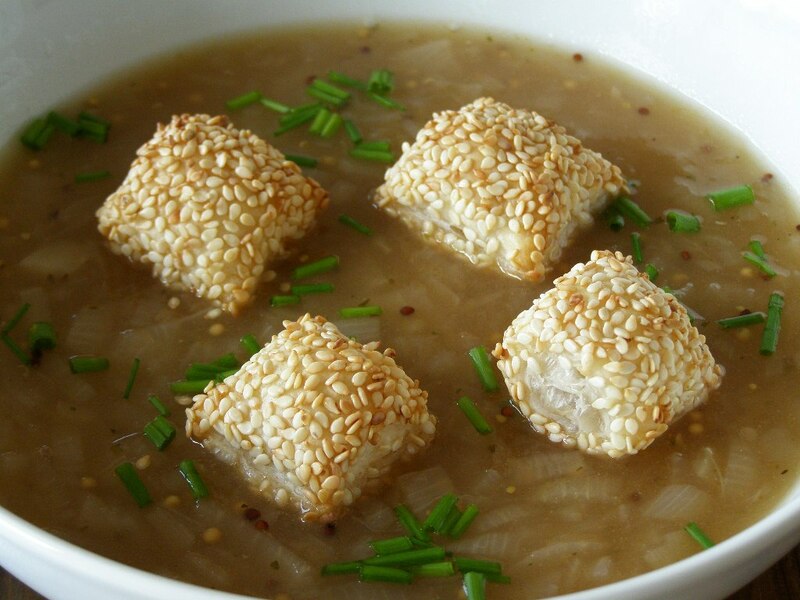 If doing squares just dip the whole square into some dairy free milk then dip into sesame seeds, coating both sides. Pop in the oven for about 7 - 12 minutes or until puffed up and golden. 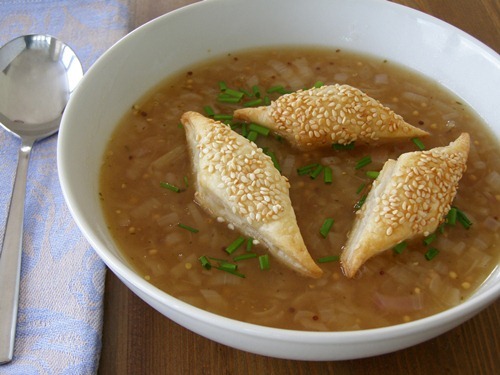 Spoon the soup into bowls, sprinkle with chopped fresh chives and 4 of the sesame puffs. Original recipe had the sesame puffs in diamond shapes which I did at first. Just as yummy but I prefer the convenience of the crouton size puffs. Up to you! Nutritional Information: based on a serving of 3 as a main dish. Guess what I have a big bag of at home, that needs to get used up sharpish? No, not kettle crisps - onions! Wow those sesame puffs look amazing, what a great idea to add to soup! I'll have to give that a try! 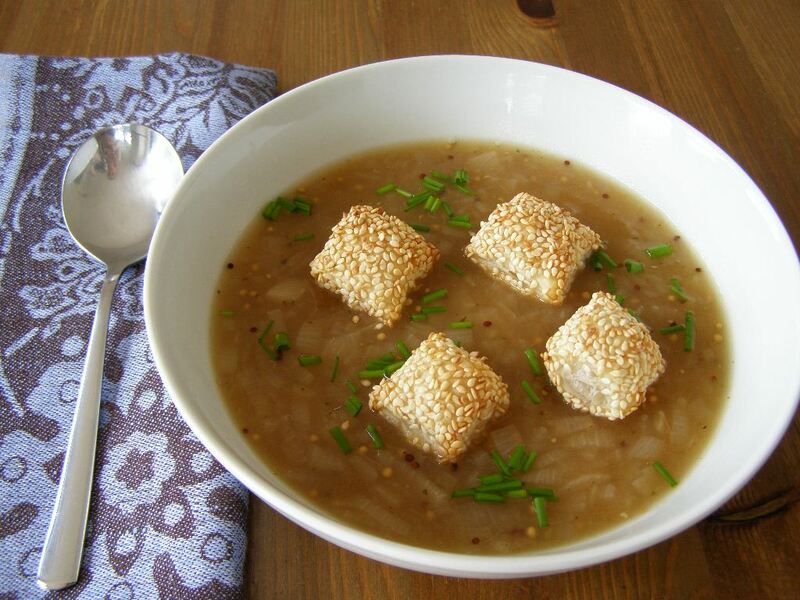 I'm having a Vegan Soup-off challenge and I hope you will enter - your recipes are always so amazing!